Welcome to the December Gifted Gorgeousness link-up. The link-up date will continue to be the 15th and I will keep the link-up open until the end of each month so you have plenty of time if you are late posting. In the past month I have only stitched two gifted pieces but did get a finish from one of them! I started this piece for the 12 Days of Stitchmas in 2017. On the 1st day you stitch on block 1. On the 2nd day you stitch on blocks 2 and 1. On the 3rd day you stitch on blocks 3, 2 and 1. And so on. Then I completed one block per month. It's a lovely design and because the same colours are used in the borders it lends itself well to the 12 Days SAL. This year I am planning to start 12 Ornaments from JCS for the Christmas Ornament SAL organised by Kaye. Once I finished this design, my thoughts turned to next year's Gifted Gorgeousness SAL. 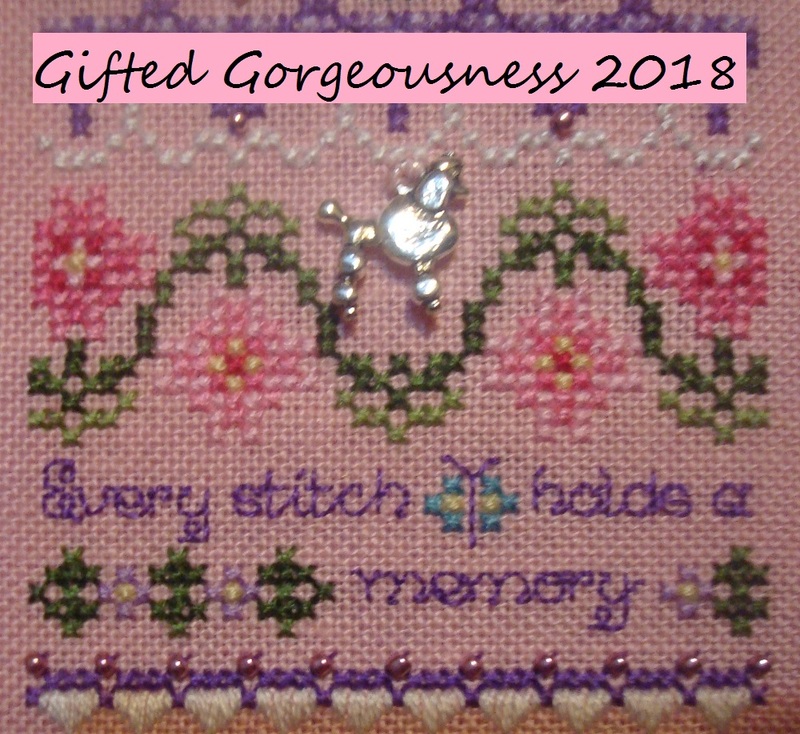 Yes, there will be a GG in 2019 and in every year after for as long as I have gifted projects to stitch! I read a blogpost recently by someone who said she often gave charts and giveaways and wondered how many of the recipients actually stitched them. I feel she needs to follow GG and she would find out! I didn't even have to choose fabric as Heather had included that too. It wasn't labelled but I think it's the called-for Lambswool Linen by Wichelt. It's certainly stiff enough for a Wichelt fabric, even after a wash. But that's OK for stitching in hand. I'm stitching it over one because we all adore tiny stitching! Now it is your turn to show us your Gifted Gorgeousness for the month. Please use your name or your blog name in the field and NOT the words "December Update" so I can easily see who has linked up this month. And link to the actual post, not just your blog. It is easier if you copy and paste the link, rather than typing freehand. Finally, the Advent Calendar Blog Hop is well underway. We've seen some beautiful stitching and heard some lovely songs too. Today is a Double Door Day so twice the fun! Don't forget to visit and leave comments on the posts of the day. 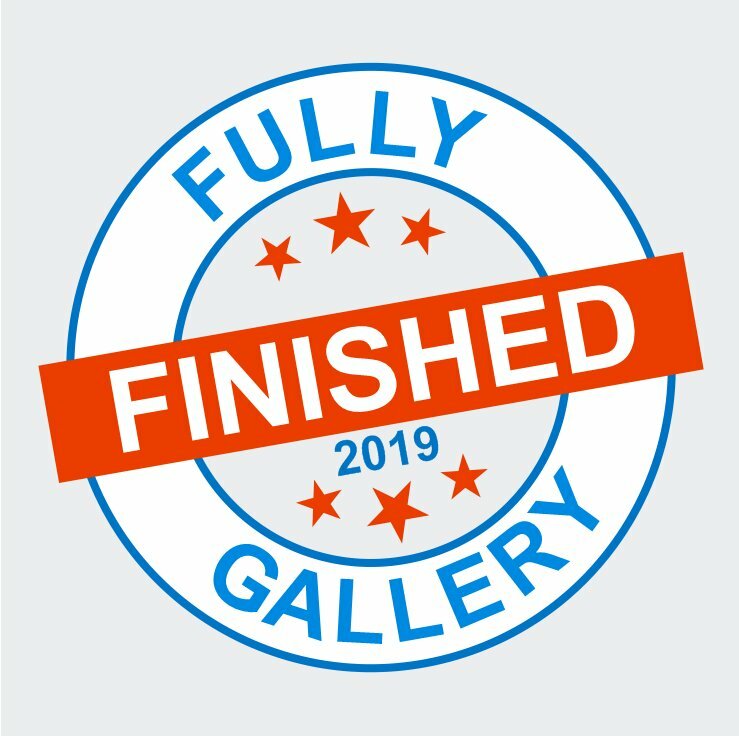 Congratulations on your beautiful finish. I've enjoyed watching you stitch it. 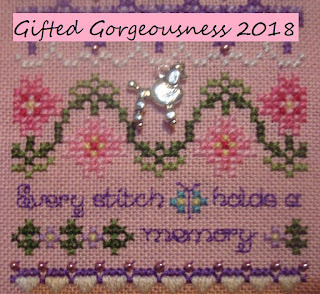 I have many gifted projects yet to stitch & I do always stitch my gifted projects - slowly, but surely ... so I will be joining in next year as well. That is such a beautiful 12 Days! 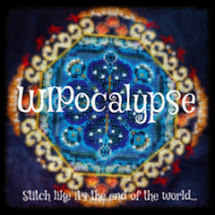 It's gone onto my Stitching List. I have really enjoyed being involved with GG, and I'll be back next year. Your efforts in organising it are appreciated! Jo: What a beautiful design, I am so happy you finished it, I am loving the fabric color, perfect with the thread colors. Jo, Congratulations on a wonderful finish, love the Just Nan 12 days. 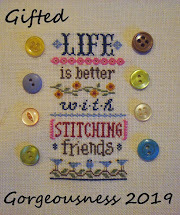 Looking forward to seeing your progress on next year's GG stitch. Oh...a finish...and just in time for Christmas! I love Just Nan patterns, though I haven't stitched many. She definitely has a distinct style!! I'm so glad you are continuing in the New Year!! 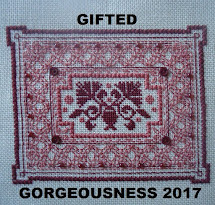 I have so many gifted ones I really need to get my act together and get stitching!! Thank you, again, for keeping us motivated and making blogging fun!! Congrats on your finish! Looks fantastic indeed. So glad to hear you are hosting again next year. I look forward to participating. I think I actually joined in every month. I tried really hard to do that at least. Love the new logo in progress. Can't wait to see it finished up. Yes we all love tiny stitching. Another wonderful twelve days finish! Nothing like stitching a new logo for the new GG! Is lambswool linen wool or flax...? D'you have a favorite 12 days block now that this one is done? I kind of like the swans a swimming in this one. Still unsure about the butterfly on a leash! Glad I got a full house this year, woo~ I wonder about gifted charts sometimes too. I think I only have a few more gifted charts to stitch and then I will be caught up on that side. Unless the shoehorn comes out. I keep it in my pocket, you know. 12 Days of Christmas by Just Nan is lovely finish. 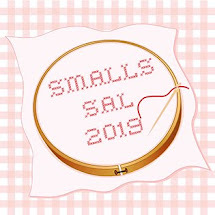 Thank you for hosting this fun SAL, you certainly know how to make it more personal, by stitching the logo..wow. Looking fwd to the next year SAL . 12 Days looks amazing, you are in my thoughts a few times a day as I look at mine on the wall at the moment. Love your JN 12 days finish. Looking forward to GG in 2019. Hope you had a wonderful Christmas. Finally linked up! I wonder if I'll learn to be on time in 2019?